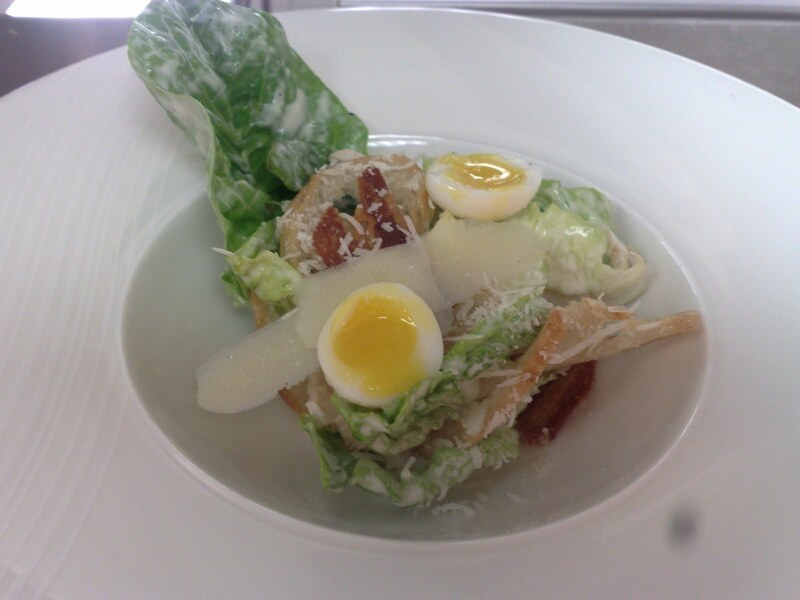 Caesar salad must be one of the most popular salads in the world; it is a great salad if made with a little care and good ingredients. Buy good parmesan and good quality anchovies as this will make all the difference to the end result. The recipe for the dressing will make more than is needed but it will keep for a week in the fridge and is handy to have on hand. I find it works very well a spoonful stirred into lightly crushed new season potatoes served with pan fried cod and some crispy streaky bacon. Discard any bruised leaves from the lettuce, wash the remaining leaves and dry thoroughly and set aside. Melt the butter in an oven tray with the garlic. Once melted, drizzle the melted butter over the slices of bread, transfer to an oven and cook at 160c until golden, 10-15mins, keep checking the croutons to prevent them from burning. Drain on absorbent paper and set aside. Place the egg, garlic, anchovies, mustard, Worcestershire sauce and lemon juice into a blender and blend. Mix the oils together (including the bacon oil if using, it adds a wonderful flavour), and with the motor still running in the blender, slowly trickle in the oils until a thick creamy sauce is achieved. Stir in the parmesan and the pepper, and check to see if a little salt is needed. Rip the cos into large pieces and place into a bowl, add a generous amount of dressing and mix to coat the leaves. Add the croutons, anchovies and cooked bacon, mix well and place into a large serving bowl top two quail egg halves and shaved parmesan and serve.